There’s nothing inherently bad about a pre workout which isn’t labelled “natural” or “organic”, but if you care as much about what you put into your body as we do, then it’s always safer to go for a natural and / or organic supplement. A great thing about modern natural and organic pre workout supplements is that they can give you as much of a pre workout energy boost as most conventional supplements. 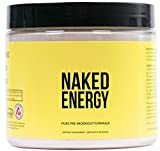 For convenience the below list shows the 5 best selling organic pre-workout supplements available for sale on Amazon.com. The list is automatically updated once a day. GUARANTEED RESULTS OR YOUR MONEY BACK: If you are not 100% satisfied, we will help you resolve your concern or provide a full refund. What are natural or organic pre-workout supplements? A natural or organic pre-workout is a supplement in the form of powder. It only has natural, plant-based ingredients rather than the standard chemical substances, such as Betaine, Citrulline Malate, and Beta-Alanine. These organic ingredients are free from chemicals and are not genetically modified. The herbs and plants used in these supplements are free from antibiotics, synthetic pesticides, and herbicides. The difference with a “natural” product is that it uses naturally occurring alternatives to lab produced chemicals/substances commonly found in pre-workout and other gym supplements. The main purpose of using organic supplements is that they are more easily absorbed and processed by the body without any side-effects like insomnia. These naturally occurring alternatives are less likely to damage your body and as a bonus, they suit specific diet preferences, like vegetarian or paleo. Finding the right natural pre-workout supplement is a daunting task, though there are not many options available in the market. There are many ingredients that are added to organic pre-workouts. But, not all of them will be as per your workout requirements and desires. This is why we’ve put together a list of the 10 best natural pre-workout supplements in 2019 that you can buy. Go ahead and read on to find out about these topmost natural pre-workout supplements available and to choose the right one for yourself. Moving on to number five. 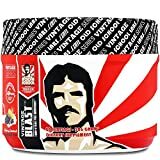 Vintage Blast Two-Stage Pre-Workout Supplement is a product that has, for a long time, been topping the charts everywhere. This superb formula provides you with all the energy your body needs before a workout or a competition to push harder and stronger. The main differentiating factor that Vintage Blast Two-Stage Pre-Workout Supplement offers is in the name: it offers a boost to your performance while you are working out. Then, it offers a sustained release of beneficial compounds for the rest of the day after you are done working out. Not only that, but the formula is guaranteed to be non-addictive, which can be a major problem with many other supplements. Another supplement you should definitely consider is the Legion Pulse Pre-Workout Supplement. This is one of the best formulae around, and Legion can prove it through numerous rigorous tests they’ve performed on their product. As before, the supplement is packed with vital amino acids and other nutrients that increase muscle endurance and focus. Within this product, you can count on caffeine, theanine, and ornithine to deliver a superb effect on your body. Legion Pulse Pre Workout Supplement uses a combination of anhydrous caffeine and ornithine to produce a signature flavor and result that has been designed by international best selling fitness author, Mike Matthews. Add to that the Nitric Oxide booster, coupled with L-Citrulline and L-Theanine, and you have a serious supplement for your workout regimen. Second up, it’s the Red Leaf Pre-Workout Energizer. A splendid supplement, Red Leaf makes sure you get the uplift you need to hit the gym with efficiency. The product is packed with beta-alanine and amino acids such as BCAAs, L-Glutamine, and AAKG which provide a bountiful nitric oxide boost. The supplement is made in GMP-certified facilities in order to make sure they’re as authentic as possible and free of all artificial chemicals used in so many other supplements. Red Leaf Pre-Workout Energizer Powder is loaded with flavor, with a unique cranberry and lime offering that is sure to get your taste buds going. There are also some great performance features that this line comes with, including beta-alkaline, with a GMP-certified production process that gives users a fantastic overall experience in this product range. Third up is the Organic Muscle Pre-Workout Formula. The supplement is, as usual, made with top-notch ingredients, ensuring as good a workout as any. Ginseng, Maca Root plus green tea leaves provide a boost that your muscles need to endure through a grueling training regime. Green tea is especially useful, as it gives you a righteous injection of all-natural caffeine to keep you going, but without the jitters. Organic Muscle is the world’s first USDA certified organic pre-workout supplement, and with that comes a unique flavor profile: Lemon Berry. This formula mixes well with water, so you can have a healthy start to your workout. Combine these elements with a low organic sugar formulation and you have a tasty supplement that will up your work out game. Needless to say, the formula is safe and fully GMO-free and fully vegan. A product that definitively deserves a place on our list is the Clean+Lean Natural Performance “Plus” supplement. This is one of the best supplements for those looking to burn calories and lose weight. The formula increases the speed of your metabolism and makes it burn more calories than usual. Not only that, but the energy it provides is strictly no crash, and the product is guaranteed to be non-GMO and vegan. All of these elements come together to create a supplement that accelerates metabolism, helps you to burn more calories, and increase your fat loss efforts both during your exercise and afterward, for best results. Extra health benefits can also be had, thanks to the antioxidant-rich and refreshing blend of berry flavored tastiness. EBoost Pow is one of the greatest pre-workout supplements for one reason – joint mobility and comfort. This is very important for you if your training is very rigorous, as hard training regimes can take a toll on your muscles, bones, and joints. FruiteX-B is a calcium fluoroborate that fast-acting and has a very positive effect on your bones and tendons. Naturally occurring caffeine helps to maintain energy and concentration levels, while healthy amino acids and nutraceutical compounds provide steady and even levels of focus, energy, and endurance. The Muscle Performance Support formulation also lends itself to delayed muscle fatigue and tiredness, which helps to speed up recovery times and get you back in action much faster. Just south of the border is Vega Sport Pre-Workout Energizer. This supplement is especially good, as it’s filled with high- and low-glycemic carbohydrates. Carbs (good ones, not bad, fattening ones) are the main source of energy for the human body, and Vega Sport makes sure there are plenty of them for you to use. Vega also contains green tea, which is a natural shot of caffeine that will not only give you energy but increase your concentration as well. Each container provides around 30 servings, which is enough to fuel your workout, giving you instantaneous and immediate sustained energy while at the gym. This not only helps you to push your limits, but also helps to increase endurance, anaerobic capacity, and mental focus too. Caffeine also helps to boost your energy levels while you are at the gym, helping you to finish your routine. Last but not least is the Garden of Life Sport Organic Pre-Workout Formula. This powdered supplement is filled with purely organic ingredients and vitamins. While the nitric oxide provides the strength and endurance your muscles need, organic kale, spinach and beets provide the vitamins that will help your muscles grow faster. This product is vegan compliant and is packed with B12, giving you a much-needed boost towards your nutritional requirements. This particular product also comes with a bonus focus supplement that helps with mental focus and alertness. This product is also gluten, dairy and soy free, helping you to stay on track with your special dietary requirements. The penultimate product on our list is the Smart Muscle 3-in-1 Natural Performance supplement. This is another superb supplement, offering you lots of energy and boosting muscle endurance through a wide array of excellent ingredients. Nitric Oxide increases endurance and strength, while BCAAs stimulate muscle growth and recovery. The formula is, of course, 100% natural, non-GMO and 100% vegan. Because this product contains all natural ingredients, you can rest assured that there are no artificial and detrimental side effects that you will have to deal with during your recovery. The naturally occurring thermogenic blend helps you to lose weight and shed excess body fat while building lean and healthy muscle tissue for great results. One of the best and the cleanest pre-workout supplements has got to be the Green Guru Nutrition’s X-Cross Energizer. This stellar supplement will provide you with all the energy you need to get through your workout, but without getting the jitters and without crashing. As a dietary supplement, X-Cross Energizer is a highly beneficial addition to anybody that is looking to enhance the quality of their workout, with benefits to both the body and mind. This balance means that both physical performance and mental clarity are boosted, giving users the edge when at the office or in the gym. The supplement features nitric oxide boosters, as well as beta-alanine and Rhodiola Rosea along with Green tea, all of which will increase your muscle endurance significantly. The supplement is safe for all types of diets, be it paleo, full vegan, or otherwise, and is guaranteed to be non-GMO. As we have seen from the above products, not all organic supplements are created equal. What your needs are for a pre-workout supplement will differ from the next person, so finding out what you need to perform your best is the right way to get the most out of your time at the gym, on the road, or in the pool. Some of the considerations for buying natural or organic pre-workout supplements are jotted down below. How you intend on working out and training will determine the active ingredients that you should be looking to take in. If weight loss and fitness conditioning is your primary goal, then energy enhancement and stamina improvement will be the product attributes that you will want to use. If muscle building and strength training is the end goal for you, then you must find the right formulation for your specific needs. Nevertheless, just like in any supplement or food, you need to carefully look at the ingredients of a particular organic pre-workout supplement. There are many all-natural ingredients that you would want to be present in your pre-workout. However, here we’ll just tell you about the 3 most important ingredients that you would want in your natural pre-workout. Yerba Mate: This ingredient has been quite popular these days. This ingredient has the same effects like caffeine. A few natural pre-workout manufacturers have begun using this ingredient in their products. Caffeine: This is a well-known ingredient found in most of the natural pre-workouts. Caffeine is proven to increase attentiveness, ATP production, and strength. This results in a better workout session by shifting more weight and building more muscles. Green tree matcha powder: This is one of the most famous ingredients in natural pre-workouts. This miracle ingredient gives you a decent boost and at the same time facilitates fat loss by up to 25% during your workout sessions. One of the other things that you must look for when buying a natural pre-workout is its flavor. Flavors are also a factor, as the standard pre-workout formulas have evolved and changed, so too have the taste preferences of fitness enthusiasts. However, this is something you can only experience once you purchase the product. Nevertheless, a tiny cue can help you with it. You have to read the label of the supplement before buying it. If it has a minimum of 15-20 kcal originating from carbs or sugars, then the supplement has a decent taste. You’ll also notice the same in organic energy drinks. However, you must keep in mind that organic pre-workouts don’t have the same taste as standard pre-workouts. Natural pre-workouts don’t have a nice taste owing to all the plant extracts in them. After all, you have to sacrifice something (taste) to gain something (health). You must pay attention to the price of organic pre-workouts before buying. Good products have good ingredients, which is why they are quite expensive. This means natural pre-workout supplements too will be costly. But, ultimately, you get what you pay for. Therefore, you must steer clear of low quality natural pre-workout supplements to save your body. Everybody’s workout goals are unique to their own exercise regimen and planning and there are plenty of different options for the individual to try out, depending on the specific results that you are after. The next part of the equation is the way that the products interact with your body and what your dietary requirements are. Popular low carbohydrate diets, such as the Paleo diet and Banting diet, all require a reduction or entire elimination of sugars. Manufacturers have seen the demand for sugar-reduced products explode; hence the ease at which consumers can find sugar free pre-workout products that they require. Energy levels are another important factor to consider during your workout and how these energy levels are maintained or boosted depends on the active ingredients that your preferred product contains. As mentioned above, caffeine is becoming more popular in pre-workout powders, which can help with both physical energy and mental focus, which is important during a workout. Some of these products rely on naturally occurring ingredients, such as Guarana, Ginseng, and Guayusa, which can provide similar benefits to more traditionally consumed stimulants, which is great for people that are caffeine sensitive or prefer to rely on a more traditional ingredient. Other products use more recently discovered mental acuity stimulating substances, such as Nootropics, which is a unique approach to working out and maintaining focus. Are pre-workout supplements worth it? There are so many different products available on the market, which means that the options that are available to consumers are greater than ever. With this increased choice, comes consumer uncertainty and confusion, which has the potential effect of leading people to buy the wrong organic supplement for their exercise needs. This can lead to results taking far longer to be realized, if at all. This is because this organic supplement provides all the energy to your body before a competition or training session with its two stages of performance boost and constant release. Moreover, it has a non-addictive formula. This is a very comprehensive and informative list on pre-workout supplements. Thank you for this article. New to muscle building and yes I was told that pre-workout supplements can be beneficial. One just has to find the right one.